This is material that in the wrong hands might be pretentious or merely dull. In Baume’s telling, though, it’s fascinating, because of the cumulative power of the precise, pleasingly rhythmic sentences, and the unpredictable intelligence of the narrator’s mind. And along the way there are crucial questions raised about how we perceive reality ... Art may also require a willingness to question the ordinary that is incompatible with conventional criteria of sanity. One of the most radical aspects of this novel is its challenge to received wisdom about mental illness ... There are no answers here, but there is a reminder of the beauty that can be found when you allow yourself to look slowly and sadly at the world. At the beginning of their careers, writers are often told 'write what you know,' but it is Baume’s second novel and not her first that does this, its imaginative scope less ambitious, its subject matter far closer to home than that of her previous work ... If you eschew conventional plot and its attendant devices, all that’s left to retain your readers’ attention is the pleasure they take in your prose. 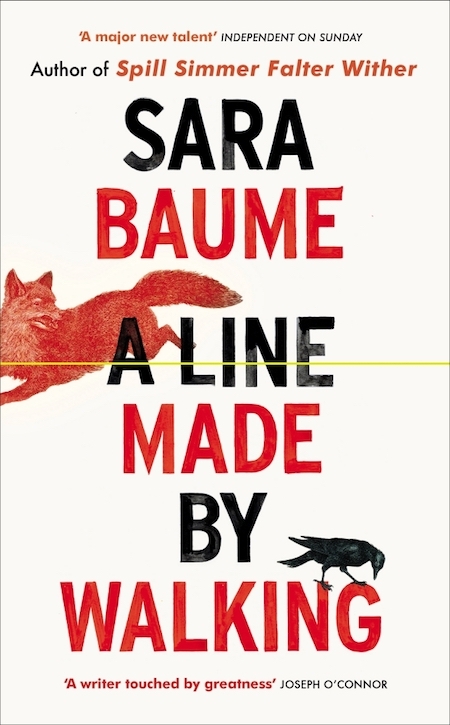 Baume’s writing is near-faultless: instinctively balanced, precise and often surprising ... A Line Made By Walking is an insightful exploration of the psychological processes and potential emotional toll of a life whose goal is to turn experience into art — or books. The acuity of Baume’s observations and the exacting lyricism of her writing are just as strong as in her debut. A Line Made by Walking has the unusual quality of documenting Frankie’s descent into depression and yet celebrating aspects of life taken for granted. By its end, Frankie is continuing her journey and cannot offer us any real kind of resolution, she is just going to keep moving. She is going to keep testing herself and hope things will get better. Frankie’s tale reminds us that that gold confetti falls everywhere, we just need to see it and not merely look at it. But the book’s great power is helping us to better understand those who can only look. It helps us understand the difference between managed discontents and unimaginable misery. What did you think of A Line Made By Walking?